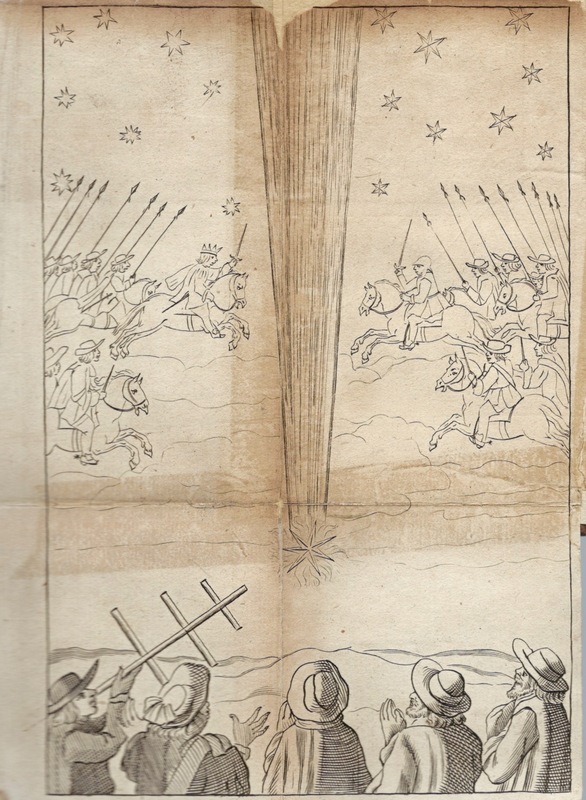 ” I know it’s easier to define what Comets are not, what they are positively to say, is not so easy: To propose them (not impose) as is fair in Schools of Philosophy: I only offer, Why may they not be providential matte framed and created of God for the ends proposed, (as the stars at first) to signifie Gods Wrath at hand ; for mans sin? and all newly made as the rainbow was. But because I pretend not to any abstrusity of judgment in that enquiry: I say as Noble Picus Mirand. Philosophia veritatem querit, Theologia Invenit, Religio Possidet. Anonymous O ̓Αστηρ του Χριστου Βασιλικος: or, Nuncius Christi Sydereus. 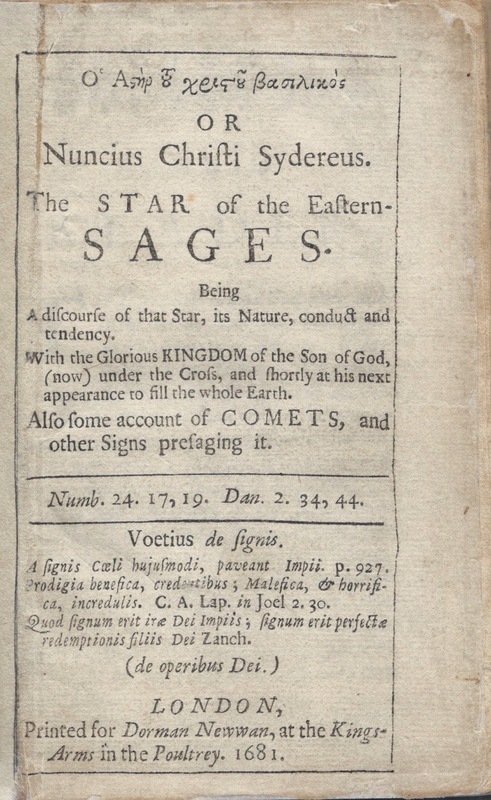 The Star of the Eastern-Sages; being a discourse of that Star, its nature, conduct, and tendency, With the glorious kingdom of the Son of God, (now) under the cross, and shortly at his next appearance to fill the whole earth. Also some account of comets, and other signs presaging it. London : printed for Dorman Newman, at the Kings-Arms in the Poultrey, 1681. Octavo 5 1/2 x 3 1/2 inches. A-K8, L5 (L4 + errata mounted and pasted in) . First (and only) edition. 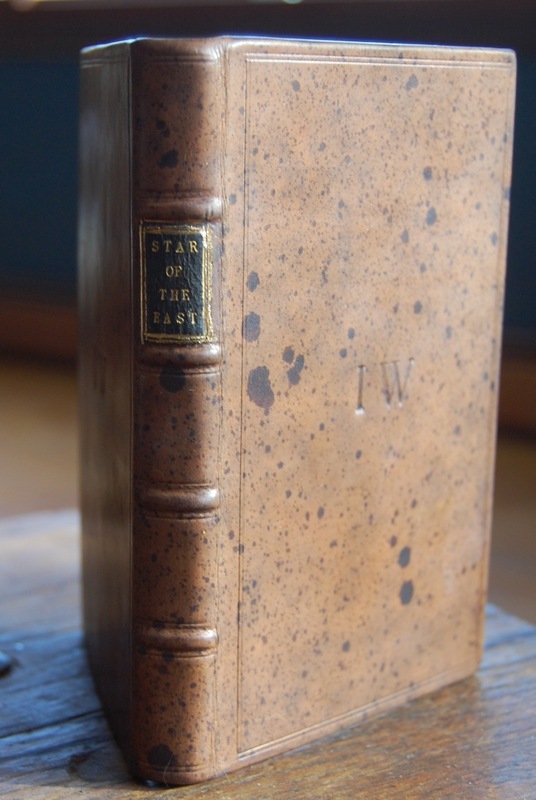 This copy is bound in full modern calf in an antique style, there are tape stains on the folding plate (see image above) , but they are minor.